Water management has become a concern in the field of sustainable development. For any organization, growing water demand, scarcity, and degradation of water quality will become and increased priority. Businesses might see disruptions in their global supply chain and marketplace as the demand for water increases. As a result, many companies are taking initiative and employing useful tools to measure water related risks. A water footprint is a metric that quantifies the potential environmental impacts related to water; the technique can help corporations to measure, manage and monitor water related risks throughout their supply chains. ISO, the International Organization for Standardization, has developed a global standard, ISO 14046, that ensures consistency, reproducibility, and credibility for assessing and reporting water footprints. Unlike ISO 14001, this standard does not provide a certification opportunity, rather it serves as guidance. Additionally, the water footprint assessment can be conducted and reported as a stand-alone assessment, thereby not required to be used in conjunction with ISO 14001.
providing consistent information, based on scientific evidence for reporting water footprint results. ISO maintains that the standard will benefit organizations, governments and businesses worldwide by providing transparency, consistency and credibility to the task of assessing and reporting water footprint results of products, processes or organizations. To read the complete documentation for ISO 14046:2014, you can visit here. Airbus, a European based aircraft manufacturer, is utilizing an unconventional and unique key performance indicator tracking system to analyze their pollution levels. The company analyzes bee colonies on site at Finkenwerder Airport in Hamburg, Germany. The insects collect pollen and nectar from plants comprising an approximately 12-square-kilometer area. The honey and wax that they produce is then sent to a laboratory for analysis. The project has been successfully running for 5 years. So far, the tests show that pollution levels from the airport are lower than in the Hamburg city center. This year, Airbus has managed to test three different sources—wax, pollen, and honey, with all of them producing pollution levels well under the set limits. Airbus is setting precedents in regards to EHS management systems programs. Traditional ways of tracking KPIs like GHG, VOC, and metal emissions are slowly being replaced by progressive, out-of-the-box KPI tracking methods like the ones Airbus is implementing. Ever since the US Supreme Court authorized the Environmental Protection Agency to regulate carbon dioxide and other greenhouse gas emissions in 2007, much debate has ensued regarding the agency’s jurisdiction. The EPA has since endeavored to regulate GHG emissions under programs that were originally in place for more conventional air pollutants. The new regulations potentially have a larger impact on certain companies and hence have spurred differences of opinion between those entities and the EPA. One of those litigations concerned the EPA’s Tailoring Rule. On June 23rd, the US Supreme Court made a final decision on the Utility Air Regulatory Rule v. EPA case. The EPA attempted to use GHG emissions as the sole foundation for requiring a major source to obtain a Prevention of Significant Deterioration (PSD) permit for construction and a Title V permit for future operations. The permit programs, which were originally designed for conventional pollutants, were “tailored” by the EPA to include CO2 and other GHG emissions. The EPA further modified the threshold emissions levels, recognizing that emissions of CO2 and other GHGs are much higher per unit of fuel than other combustion generated. Consequently, much smaller sources would be classified as “major” if the standard thresholds were applied. The Supreme Court evidently made a fragmented decision on the four year long dispute. Five justices ruled that the EPA cannot require PSD or Title V permits from a source that exceeds threshold emissions only for GHGs and not for other pollutants, while seven justices ruled that the EPA can add GHG restrictions to PSD and Title V permits for sources subject to those programs regardless, due to large facilities already being subject to permitting. As a result, the decision allows the EPA to add regulatory limits on GHG emissions to permits for the largest sources and prohibits stand-alone regulation for a small number of others. To read the full decision, visit here. Last April, The European Parliament adopted the directive on disclosure of non-financial and diversity information by certain large groups and companies (Directive 2013/0110(COD)). This follows the proposal introduced by the European Commission to enhance business transparency regarding social and environmental matters. The Directive is expected to be enforced by August 2014, once it has been adopted by the Council and published in the EU Official Journal. The Directive will require large companies, with more than 500 employees, to include their performance on a number of non-financial metrics in their annual reports. This applies to approximately 6,000 large companies and groups across the EU. In particular, these companies will be required to disclose information on policies, risks and outcomes in regards to: environmental matters, social and employee-related aspects, respect for human rights, anti-corruption and bribery issues, and diversity in their board of directors. Currently, the Directive does not set specific reporting frameworks for data. Instead, it allows flexibility for companies to disclose relevant information in ways that they consider most appropriate. For example, through the use of international, European or national guidelines such as the UN Global Compact, ISO 26000, or the German Sustainability Code. Companies will be required to disclose concise, useful information necessary for a wider understanding of their development, performance, position and impact of activity. The rules permit disclosures to be made at the group level, rather than by individual companies. The Directive allows the European Commission to develop guidelines to facilitate the disclosure of non-financial information by companies, taking into account current best practice, international developments, and related EU initiatives. In addition, the Directive symbolizes the first step towards the implementation of the European Council conclusions of May 22nd 2013, which outline the need for further transparency on tax matters and ensuring country-by-country reporting by large companies and groups. The Commission supports this objective and will endeavor to effectively deliver the review clause included in this legislation. The Directive will require ‘public interest entities’, defined as ‘mainly listed companies and financial institutions’ employing more than 500 people in Europe, to disclose information on policies related to social and environmental issues. The legislation will force companies that have not already published non-financial performance reports to focus more on the social and environmental aspects of their business. For more information, please fill out the contact form below. Alternatively, visit our website for information on how we could help your organization in this area. The International Organization for Standardization (ISO)’s efforts to complete the revision of ISO 14001 has reached a significant landmark. Following a consultation on the previous draft, the working group has recently completed the preparation of the “Draft International Standard” (DIS) version of the revised ISO 14001. This suggests that it is very likely that the revised standard will be published in mid-2015, as anticipated. Two meetings of the working group were necessary, in February and just recently in Panama, to address all of the comments from the previous consultation and to reach a consensus on the content of the DIS. A small task group will now edit the agreed text, which will then be formatted and translated by the ISO secretariat for a comprehensive consultation exercise, due to commence for three months in September. Following these actions, ISO will collate the comments for the working group to review in February 2015. At this advanced stage, the working group is not likely to make any substantial changes to the content, allowing ISO’s members to approve the final draft (FDIS), and eventually publish ISO 14001:2015 next summer. The International Accreditation Forum (IAF), the global “regulator” for certification organizations, informed the working group of their agreement with the recommended three-year transition period for organizations certified to ISO 14001:2004. Consequently, certified organizations will not have to meet the requirements of ISO 14001:2015 until 2018. Significant changes have been made in the new version of the DIS, modifying the previously published draft. We will be publishing a series of short articles on these changes, explaining what they will entail for certified organizations. Preparing top management and others for the transition. ROC One’s Rainer Ochsenkuehn is one of USA’s technical experts appointed to the ISO working group revising ISO 14001 and is also working with the group developing ISO 45001. Please fill out the contact form below if you would like to know more about the work on these standards and the implications for your organization. Alternatively, visit our website for information on how we could help your organization with its certification and internal audits. 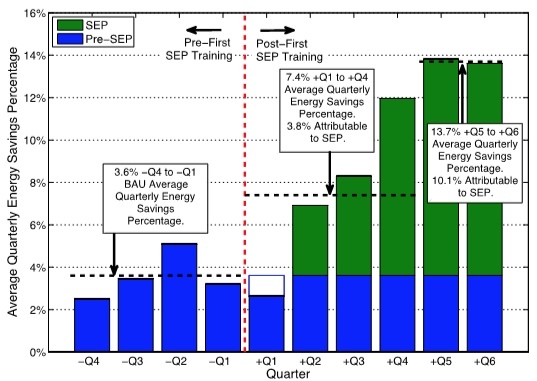 ISO 50001, an energy management system standard, utilized by the Superior Energy Performance (SEP) program, provided 9 facilities with an annual savings average of $500,000 and an average payback in 1.7 years according to a recent study. The U.S. Department of Energy (DOE) supports the Superior Energy Performance (SEP) program, which provides industrial facilities and commercial buildings a framework for achieving continual improvement in energy efficiency in accordance with the International Organization for Standardization’s energy management system, ISO 50001. To learn more about the study visit here.